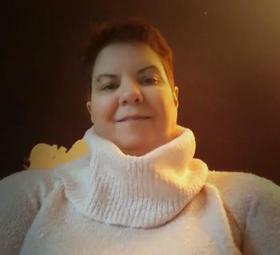 Julie Ann Compeau, 54, of Traverse City, went to heaven Tuesday, May 30th, 2017. Her strong faith carried her to a beautiful, happy, peaceful, pain-free place, she was called home. She was the only daughter to Robert & Antoinette Compeau, who preceded her in death, and she’ll be with her brother, Patrick Compeau again. She enjoyed life and was always filled with wisdom, love, and faith. You always had fun with her, she created memories, and awkward moments, and you would laugh until you cried. Julie taught us so much and was always there, and a fighter who was always optimistic. Julie was a sarcastic warrior, a wisecracker, a comedian, always ready with a joke or silly face to lighten things up. She would always keep you in check and was the voice of reason and sanity. You knew where you stood with her and she always said “I love you”. She is survived by her loving daughters Heather Compeau, Reneé Compeau, Jazmine (Elijah) McGinnis, and loving son, Jarred Compeau; her favorite grandson Kayden Robertson; and remaining brother Michael Compeau. She is also survived by everyone she ever encountered, anyone who called her mom, bonus mom, sister, aunt, mentor, or friend. You'll sure be missed down here. Your love won't soon be forgotten. Memorial Services will be held 11am, Saturday, June 3, 2017 at the Greater Life Apostolic Church, 757 S East Silver Lake Rd, Traverse City. Please visit www.lifestorytc.com to sign the guest book and share your thoughts and memories with the family. The family chose Life Story Funeral Home, Traverse City.